Yaounde — Aid workers at the epicentre of the worst Ebola epidemic in the history of the Democratic Republic of Congo say they are facing a spike in attacks and threats, slowing their work and potentially triggering a surge of new cases. While two Medecins Sans Frontieres (MSF) facilities treating Ebola patients in North Kivu province were attacked last week, aid workers said they are only the latest in a series of incidents. One of the facilities has since reopened. "We had at least 10 cars that were broken into in Katwa," said Michel Yao, incident manager for the World Health Organization referring to an attack last month in an area in the eastern trading hub of Butembo, a city with strong links to neighbouring Uganda. "There are increasing attacks on different teams," Yao told the Thomson Reuters Foundation by telephone from Butembo. He cited the difficult conditions faced by aid staff working on disinfection, safe burials, support of health facilities, those providing vaccinations to treat Ebola and others. The current Ebola epidemic, first declared in August, is believed to have killed at least 561 people, so far, and infected over 300 more. It is unclear who exactly is behind the attacks, said Jean-Philippe Marcoux, country director for the Mercy Corps charity in Congo. "It's a minority of groups but sometimes they react violently and target response workers," he said. "To a certain extent, Ebola has been politicised during the run up to (December's presidential) elections," said Marcoux. Some communities believe the Ebola response to be part of a political conspiracy to control or exclude the local population from the electoral process, he said. Some people accuse the government or the international community of "bringing us Ebola", Marcoux said. In some neighbourhoods, locals ignore potentially life-saving precautions, Marcoux added. "They refuse treatment, they refuse follow ups, they refuse vaccinations and they refuse assistance for the (safe) burials." "The teams and staff are very scared," WHO's Yao said. "When our team enters (certain areas), they are suddenly surrounded by hostile people who are even armed." "We saw bullet marks on the wall," Yao added, referring to an attack on an Ebola treatment centre in Butembo on Wednesday. The centre was set on fire while an extended gun battle between the attackers and security forces ensued, health officials said. 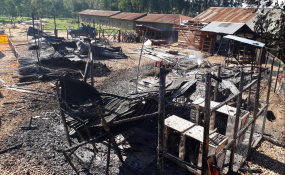 The torching of the two centres prompted Medecins Sans Frontieres (MSF) to suspend medical activities. "It will definitively affect the prognosis of people surviving Ebola," Yao said. "The fear is that if we cannot work in the coming days and weeks, we will have a major surge of cases in Butembo. I cannot exclude re-infection in places where the outbreak has been brought under control. This is really our fear." Blaming the attacks on insecurity and violent gangs "would be too easy," said Marcoux in a statement released on Thursday. "Building community acceptance and securing trust has not being given the same weight as treatment, and we are continuing to see the consequences - suspicion abounds and case numbers rise," he added. "The only way around it is to establish dialogue, which takes time, resources, and with the right people that (communities) can trust - that would be a good place to start."